Celebrate Volunteers! National Volunteer Week is April 21st - 27th. We're looking for a new kind of volunteer at Marine Parents. Specifically, parents or family members who can represent the organization in their local communities and keep the recruiting offices informed of the good works we do. In this issue - Thank You to Our Volunteers! 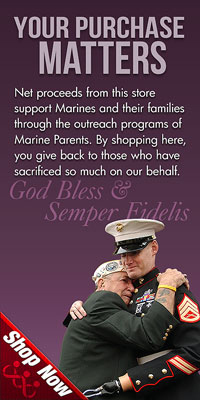 Marine Parents was built on volunteer hours, time, dedication and support. Our mission is two-fold: provide support to Marines, military personnel, and their families and give people in communities across our great nation opportunities to support the troops. In ten years of service, part two of our mission, with volunteers representing nearly every state, has logged an estimated 200,000 volunteer hours. Our country's commitment to support the troops has increased a thousand-fold compared to just a few years ago. This is evidenced by the sheer volume of organizations with troop support as part of their mission, and the number of volunteer hours in service to the troops. Marine Parents is proud to add over 18,000 hours to that pool of service in 2012; hours our volunteers contributed in support of the troops and their families. This entire issue is dedicated to our volunteers. Join us as we recognize our volunteers and celebrate their service. National Volunteer Week was first established in 1974 by then-President Richard Nixon. In the four decades since, it has grown exponentially. This year, the week of April 21-27 marks the 40th annual edition of this celebration of volunteering. National Volunteer Week is about inspiring, recognizing and encouraging people to seek out imaginative ways to engage in their communities. It's about demonstrating to the nation that by working together, we have the fortitude to meet our challenges and accomplish our goals. 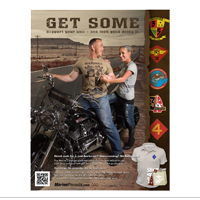 MarineParents.com offers "a place to connect and share�" online through Marine Family Network or MFN. MFN could not function without the support of numerous volunteer moderators. 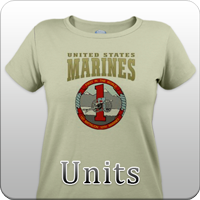 MFN volunteers dedicate countless hours to the moderation of the online community and responding to questions and concerns submitted by Marine and/or recruit families. Maria L. is a volunteer from Brooklyn, New York. 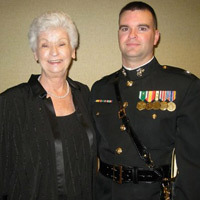 She found Marine Parents almost six years ago when her son shipped to boot camp at Parris Island. 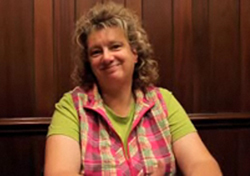 She became a volunteer message board moderator for our Recruit families shortly after, winning the hearts of everyone. Her posts are calming and helpful for our members who have a new Recruit in boot camp. Besides answering questions, guiding her groups, and offering support, Maria gives a piece of herself with her personal stories from the days her son was in boot camp and through his two Afghanistan deployments. The Care Package Project offers various types of volunteer opportunities. Some Care Package Project volunteers hold fundraisers to raise funds for shipping and/or drives to collect content for packages. Other volunteers write thank you cards and letters to include in care packages. Purple Heart Hero Support managers and support volunteers serve meals to wounded heroes and their families, and, more importantly, they engage in the often-difficult recovery process of many wounded heroes and their family members. Purple Heart Hero Support volunteers provide fellowship and a strong support system to help alleviate feelings of fear, confusion, anxiety, and anger. Operation Prayers and Letters is comprised of thousands of volunteers--adults and children--who donate their time and energy to write card and letters showing support and expressing gratitude to our wounded heroes. Paul R., from Rocky Ridge, MD, is a Purple Heart Hero Support volunteer at the twice-a-month Sunday dinners at Walter Reed National Military Medical Center in Bethesda, MD (WRNMMC) --making a 90-minute drive each way--and is known for his delicious homemade chocolate chip cookies. He served in the Marines from 1977-1982 and is the proud father of three adult children, including a Marine who recently returned from an Afghanistan deployment. 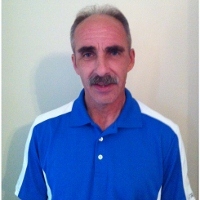 Paul has been the key volunteer involved with distribution of adapted shorts and the production of adapted camouflage blouses for the combat-wounded Heroes on the surgical floor. This clothing allows the Heroes the independence to dress themselves. In early 2011, Spice of Life became involved with the Care Package Project and its members would (and still do) help prepare the items that go into the packages. In 2012, some of the members of Spice of Life began sewing adapted shorts for wounded heroes in support of Purple Heart Hero Support. We want to take a moment to recognize a volunteer that has been with Marine Parents for many years. One volunteer. 11,000 hours. 9 years of service. Sandy has been working as a volunteer at Marine Parents since 2004 and logged over 9,000 volunteer hours since mid-2006; that's two lifetime awards and on her way to a third. We started tracking hours in an official capacity in 2006. Since that time, Sandy averages 25 hours a week. If we took her average, we would need to add over 2,000 additional volunteer hours to reach her "real" total of an estimated 11,000+ hours working for Marines and their families at home. "a way to thank and honor Americans who, by their demonstrated commitment and example, inspire others to engage in volunteer service. The program continues as an initiative of the Corporation for National and Community Service (CNCS)", according to the official awards website. There are three "levels" of the award for yearly volunteering -- gold, silver, and bronze. 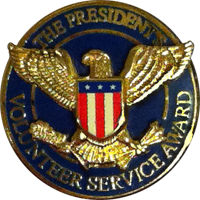 In addition to the yearly awards, in which all volunteering hours must have taken place in the previous 12 months, the Council also established the President's Call to Service Award, a lifetime achievement award for those who are truly devoted to the cause of volunteering, that is presented to anyone who has dedicated 4,000 hours (the equivalent of two years of full time work) to volunteering over the course of their life. Here at Marine Parents, we're honored to be able to present 40 Presidential Service Awards later this month. 11 gold, 9 silver, and 18 bronze awards, as well as two President's Call to Service lifetime achievement awards have been earned this year by our volunteers. 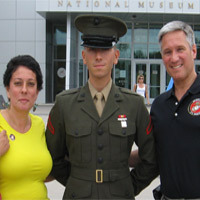 The banner photo is a Marine Corps photo taken 05/27/12 by Jay Hirsch. - Pfc. Christopher J. Laugle, based at Marine Barracks Washington, stands at attention on the center divide of 23rd Street saluting motorcycle-riding veterans as they pass during the 25th annual Rolling Thunder, a motorcycle rally held Memorial Day weekend to bring awareness prisoner of war and missing in action service members, May 27, 2012. This was the first time Laugle and Lance Cpl. Zachary M. Powers, also based at Marine Barracks Washington, were in the street honoring the veterans participating the ride. They had joined retired Staff Sgt. Tim Chambers for whom this is a yearly vigil. Chambers, referred to in past years as the lone Marine, has stood atattention holding a salute during the ride since 2002 to honor the sacrifices of the nation's veterans. Last year, he maintained the more than three-hour salute despite a broken wrist.